We love to have visitors. 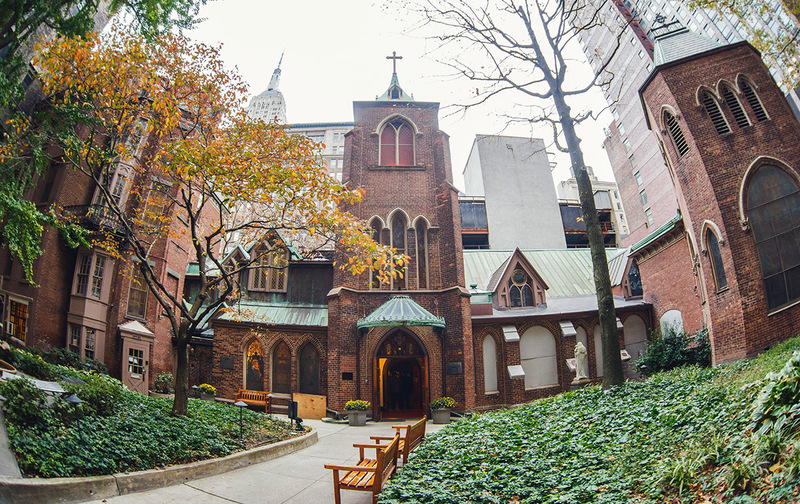 Every Sunday sees a stream of visitors who come here to photograph the stained-glass windows, wander through the nooks and crannies, and discover the unexpected, such as the actor Rex Harrison’s memorial plaque placed next to a Madonna window. Some come for a guided tour and listen to the story of how we came to be called the "Little Church Around the Corner." Others come to carry out research on our various art and artifacts. The main church is open Sundays from 8:10 am to 5:00 pm (or the close of Evening Prayer) and on special occasions as advertised. Our Holy Family chapel is open weekdays from 8:30 am to 5:30 pm. In addition, the Holy Family Chapel is open on most Monday evenings from 6:00 pm to 6:45 pm when the Meditation Group meets, and also on most Thursdays evenings for 6:30 pm Mass when the Bible Study Group is meeting. The Parish Office is open Monday through Friday from 9:00 am to 5:00 pm. Guided tours are available every Sunday after the solemn mass at 12:45 pm. Meet at the organ in the sanctuary. Group tours are available by appointment. To contact the Parish Office or book a tour, call 212 684-6770 or e-mail receptionist@littlechurch.org. By subway: Take the 1, R/W, or 6 to 28th Street, or take the B/D/F/M/N/Q to Herald Square. By bus: M1, M2, M3, M5, M6, M7.